Home / The Archives / CBB Poll: Where Do You Park? The management of the office building I work in was nice enough to install a bike rack, but it is out back by the loading dock. This was fine when I rode my 1977 Yama 10-speed to work, buy last July I got my baby and I carry it in the door, up the stairs and into my office — never touches the floor until I set it under my window. Right now, I park it in a bike rack that’s indoors (parking garage) that does have guards present. It’s semi-valet parking, where most of the parking spots require you to leave your keys because parking is three or four cars deep in some parts. The bike rack, a converted motorcycle parking space, is not readily visible from any guard station. I don’t have a problem leaving either of my current bikes ($80 used hybrid, $100 used MTB) in the rack, but if I end up getting a nice road bike, I’m going to have serious qualms about leaving it there. I might use this poll’s results to plead my case with the HR department if they give me any grief over this. Most commuters I know with decent bikes take theirs inside with them somewhere. In my case, “inside” would mean in my cubicle, or in a storage closet down the hall from my cubicle. There is a bike rack outside my building that is visible from the windows, and is in the shot from the security cameras. If I forget the lock, I’ll bring the bike into my office. I work in a grocery store, up to tree stores and different departments. I never asked, just park either my Bianci hybrid or Surly touring bike in the back of the store closest to where I am working. Co-workers also help keep an eye on it. I wonder how much less pollution there is because of my biking instead of driving the last 10,000 miles. I work at a corporate campus in Michigan and lock my bike to a lamp post outside. The only people who have reason to come within a mile of my bike work for my company in some capacity, so I don’t worry too much about it. Then I wouldn’t have to lug around any kind of lock and could keep it out of the weather. When I traveled to the UK for work, I rented a bicycle instead of a car and was really pleased to find a nice covered and locked area for bicycles. The combination to the locked gate was relatively common knowlege to the employees at the plant, but would keep others out. I locked it to the rack anyway. If I ride my good bike, I bring it in the office with me. If I’m riding the rain bike, it’s probably raining so I parking it in the secure, covered bike parking we have at my location. Electronic badge access is required to get into the bike garage. Uncovered bike racks are also available. Other bike commuters at my office park their bikes in stairwells or in hallways. At work at home, I keep it inside wherever I find space. Other places I go, I lock it up outside to bike racks, signs, parking meters, etc. I try not to lock it anyplace secluded if it’s outside. underground garage with bike rack, indoors. requires badge to get in. i feel very secure about leaving my bike there. in a building housing probably around to 200 workers, there’s about 4-5 commuters daily. some days i am the only one, on my trusty 925.
bikes are not allowed in the building. if i ever get myself a road bike (why is it so hard to find the perfect one? ), i would feel fine about parking it in this garage, but probably would not ride it that much. the 925 is really the ultimate commuting bike. I am an auto mechanic (very ironic, I know) so my bike sits next to my toolbox all day, I even work on it during my lunch break. Out of 12 mechanics there 2 bike commuters, not a bad ratio. Outdoor bike rack very visible. About once an hour I go to the window to check and make sure it’s still there. In the server room where nobody can see it. I lock up my bike to a rack in a covered garage with roving security. Not enough to keep my bike from being stripped of all the good parts including my bell. I suggest riding a beater and locking it up well, better than I did. In my office, or in the vacant office next door to mine. I park in the vestibule of the back entrance of the office. Not too many people come in that way, it has a securely locked door, and it’s tiled so the tires don’t stain anything which is nice.. The Owner comines in occassionally and notices, but hasn’t commented other than “oh you ride your bike in?”, so I’m assuming it’s ok! Working at various locations around a spread-out college campus, I have the luxury of using a visible bike rack at work 95% of the time. Occasionally, the racks are so clogged with student bikes that I am forced to lock up to a parking meter or a metal railing, but I try to avoid this. As annoying as a crowded rack can be, at least it shows a good number of folks are riding…My American-made Trek 930 with slicks, fenders, rack, etc. hanging out with all the fixies and Bianchis ! To a rack in an underground garage, right outside the security office. I leave the lock on the rack at night, so I’m not schlepping a heavy u-bolt lock on my commute. The rack is small and the building is large so it fills up frequently, especially when the weather’s nice. There are other less secure racks in the garage that I use, which makes me a little concerned when I have to use them. Some others in my office bring their bikes into the cubicle. I’m lucky. My employer encourages bicycle commuting so we have a large bike room with hooks to hang up our bikes. It’s a locked room so only employees can access it. Along with storage area there are also work tables with tools to make repairs, or patch up tubes, various supplies and air pumps. We even have showers and lockers. They really really want us to ride to work! Happily I do about 3-4 times a week from spring to fall. 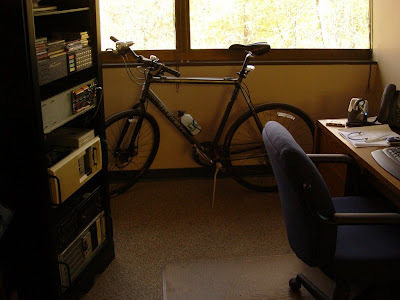 I used to park my bike next to my desk. After a very wet coimmute, I ticked of the facilities people with my “wet trail” from the front door to my desk. I was cleaning it up when I ran into them. We compromised and now I park it in a stairwell. My employer has inside locked bike parking with lockers and bike pumps and such. Other wise I keep my bike inside my apartment in the hallway. When I go out I lock my bike to whatever I can with my trusty U-lock. No problems so far. I also ride a crappy looking, but deceptively well performing bike so that people will be less inclined to take it. The only problem I have ever had is when someone actually broke into my house and took my expensive road bike. Now, I’m done with expensive bikes. I am fortunate to have an indoor, secure stairwell to lock my bike. I used to lock my bike to a secluded outdoor bike rack, but within my first week at this job someone tried to steal my bike (I work nights at a library). I rose a mighty stink until my supervisor found my current parking location — inside two security doors (magnetic card access only), out of sight of almost everyone in the entire building complex (no one uses that stairwell — because the elevators are right next to the stairs). Sweet! My employer (a major player in the bicycle industry) is somewhat lackadaisical about encouraging us to ride. We do have indoor parking, with a rack for ten (or so) bicycles and space for more, but bikes have actually been stolen from this area when no one is looking, so it is not as secure as it could be. We also have no showers or ramp into the building (small things, but helpful). I park inside, away from the rack (my XtraCycle takes up way too much room), although I have been tempted to park outside when I have been Employee of the Month, as one of the perks is the parking space just outside the front door. That would actually be less convenient, though, so I still bring the bike inside, even then. At home, it stays in the garage. I chain my hybrid up to a rail inside the parking garage. I feel this is a fairly safe place to keep it. Only company employees will be back there anyway. I take my panniers, computer, and all lights off though. There’s a storage room at the back of the building where I work; I got permission to keep my bike in there. There’s a bike rack outside, but I hope to keep parking my bike in the storage room for obvious reasons. I’ve heard of other people just parking their bike somewhere without asking permission, but I felt in my company, asking permission would be better. I was also fairly sure I’d get it, so that made it easier. My client provides a bike rack next to the motorcycle parking inside of a secured parking deck. This is the nicest place I keep my bike outside of the back room of my house. When running errands, I lock up the bike in a place that is visible — rack or otherwise. I like maximizing the opportunity to speak with others about spending more time on the bike, and locking up affords a good opportunity to strike up conversation with passer-by. At my daughter’s soccer matches, I bring it into the stadium and set it in front of me. Either it comes inside and leans against my desk (more often than not), or it leans against the stairwell outside, sometimes locked. We had our ‘office’ bike ripped off from the same spot, so I get nervouse about leaving mine outside! I use folding bikes…. I have 2. I find they easily fit under my desk at work or in my small apartment. I commute on a recumbent trike – too awkward to bring indoors. The only bike rack sits at the main smoking area by the back door, shielded from view of the street. Most everyone knows who owns the quirky trike, and there is virtually always someone out for a smoke, so it’s a rather secure location. Do have to brush off stray ash from the seat in the afternoon. The road bikers use a back lobby or their cubicle. Company provides 4 shower/locker rooms (2 for each gender) to the benefit of the lunch-time runners and bike commuters. Locker space is scarce, forcing towel drying in cubicles.